Can you imagine a trip where you get to not only site visit but also get to buy new stuff that you need at low costs? Well, Vietnam travel has such an experience and much more. If you aren’t careful, you may end up doing more of the shopping than touring the sites. That’s because Vietnam has a lot to provide you whether to want to buy or walk around doing window shopping. Among the many shopping centers in Vietnam that will offer a fantastic shopping spree is Ho Chi Minh. Apart from Ho Chi Minh having a lot of beautiful tourists site, there’s plenty of shopping centers for all kinds of shoppers. Diamond Plaza has an exceptional shopping experience for anyone traveling to Vietnam at any season. Shoppers not only get to walk around to purchase different kinds of items but also entertain themselves in the nearest pleasure joints. You will see Diamond Plaza beside renown landmarks of 30-4 park, Notre Dame Cathedral and the central post office of Saigon. The plaza has several floors trading different types of commodities which include clothes, toy stores, cosmetics among other products. You can even watch cinema from the cinema house found in the plaza as you wind up the evening. In Ho Chi Minh city is the sophisticated Takashimaya center which deals with different kinds of products whether locally or internationally. Global commodities found here come from different parts of the western world which include the US, Japan, and Europe. Most shoppers visiting this high-end store center are mostly of the high-class social status. Examples of lady items from the Banana Republic include Cole Haan, footwear, children products, and Geox among others. If you love the class, then Takashimaya plaza is your babe. Parkson Plaza will provide you with the most exquisite ambiance while shopping than never had before. That’s because the square has all kinds of items you will want to shop for while in the city of Ho Chi Minh. The plaza has several branches in entire Vietnam with the most famous one at Le Thanh Ton street. To be more precise you will find Parkson Plaza after passing Vincom Center B. Be ready to spoil yourself with different kinds of perfumes, cosmetics, shoes, and sportswear. The plaza ensures that there’s something for everyone whether male or female, young and old. Saigon square is Ho Chi Minh’s number one fashion house offering products at wholesale prices. This fashion store covers two floors with items of all kinds of seasons. Buying in bulk is cheap as you get to the discounts. You won’t get enough of things such as shoes for both men and women, handbags, toys and many other products as the square has plenty of supplies. As a wise shopper it’s advisable to work around, doing price research before settling on the final buy. That way you will have stronger bargaining power for lower prices. 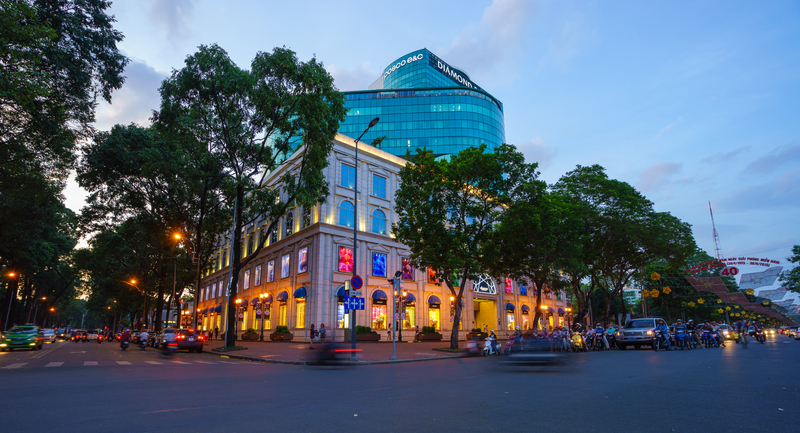 With more than 200 retail branches all over Vietnam, Vincom center tops among the largest malls in Ho Chi Minh. Electronics, clothes, wines, cosmetics, handbags, home decor, and many other items are all here. You, therefore, have no excuse for not shopping once at Vincom center. Treat yourself to that shopping spree you have been thinking of for so long because Vincom center has all your desires. Vincom center is a must stop during your Vietnam travel as there so much to enjoy shopping.